We have an important announcement coming Friday. See you then! The Second statue makes me sad…can I hug it? Oooh, looking forward to Friday! Well, no one’s stopping you. AWWWWW- can I hug a ghost though? I need it too, Second. Ah, ghost physics. Gotta love ghost physics. He’d probably phase through me. That’s my luck. If I were them, I’d be more worried about Ecta. But on the other hand, no bathroom cleaning! Ecta can do what she wants! Well, they are concerned, but it’s not going to stop them. They have some important relaxing to do! I look forward to see what that malicious grin of her’s is for, guess I have to wait and find out. “I look forward to what that malicious grin of [Ecta]’s is for” said no one in the actual story ever. Honestly, he IS a good boss. Gets a lot of it from his dad, although he’d never admit it. 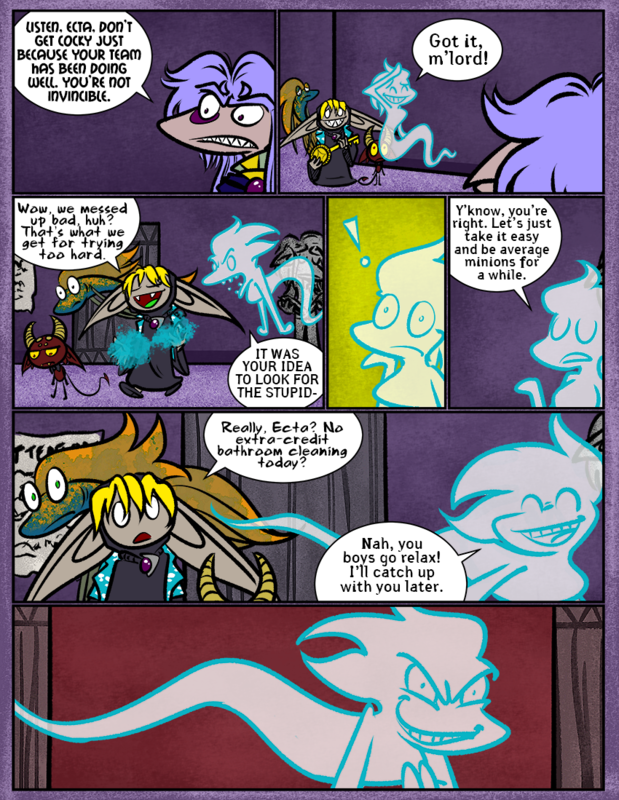 There’s also the fact that some of these people (the ghosts mainly, including Ecta) have been a member of his household for his whole life. She’s practically a godmother to him. Oh boy. Looks like Ecta has something nasty in mind for her team. Nah, that’ just the face she makes when she’s about to sneeze. Ecta, stop while you’re ahead! Ecta, stop while you’re a dead! Hey, as a bonus doodle one time, can we see what Ecta looked like before she kicked the bucket? You’ll see that as more than a bonus doodle some day! But not until then, I’m afraid. I exhausted my language capacities. It’s a Philip Glass song. It’s super-ominous and creepy. “koyaanasquansii” is the only lyric. It’s usually used to convey the character has slipped into Tranquil Fury mode. That face can only mean one thing… secret extra-credit bathroom cleaning! Not to being demoted, she isn’t! Okay, this question has been bugging me for a while and I can’t seem to find a answer. Why dose the majority of the ghosts have long faces? Out of all the living creatures, Skarva, Salamandrians, and Flish seem to be the only ones with long faces. Since a ghost eventually turns blue and transparent, dose it also grow its mouth or face out? Heheh, you’re not the first to ask. Yeah, ghosts eventually lost the rigidity and definition of their forms and become looser and squishier. The face-lengthening thing is just something that happens over time. It’s especially exaggerated with Ecta because she’s always making really wide expressions (like that smile). Originally it was just a design thing because I thought it gave them more character. I was about to go on a whole theory that since only beings that are one way or another related to water (The Skarva family, Flish, Salamandrians…) have long faces, that it must mean the spirit is like the life blood or water of the person. And the ghosts are like fish floating in the magic or physical plane. Well, Floyd doesn’t seem too bummed out about that, nice positive attitude. Hey, it seems like a great excuse to chill out, after all!